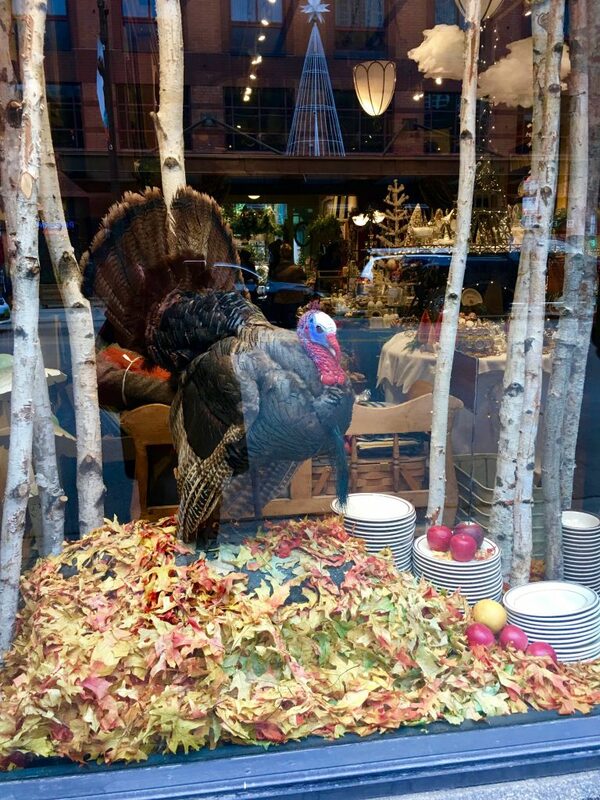 I know we’re all knee deep in Thanksgiving planning but Tom and I are just back from a trip to Chicago, so can you handle a trip report? We’ve been to Chicago many times, but this was one of our favorite trips so I want to document some of the things that made it special. 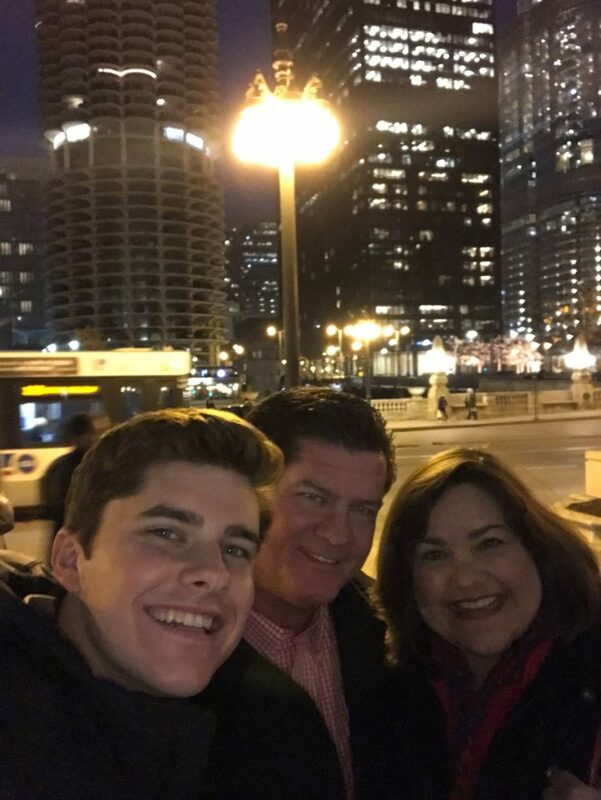 On all of our previous trips to the Windy City we’ve stayed either on, or just off, the Magnificent Mile. 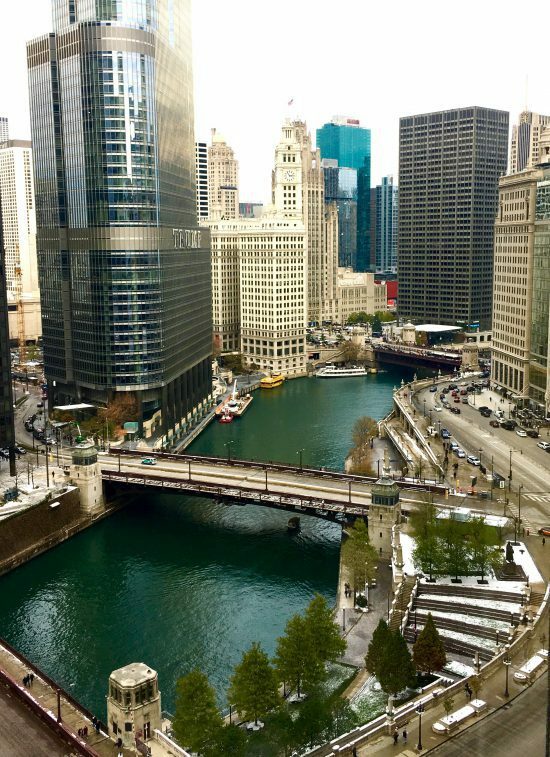 But I’ve always been fascinated with the Chicago River and the buildings that line it, so as the family travel planner, I decided to book one of the hotels that had a river view. 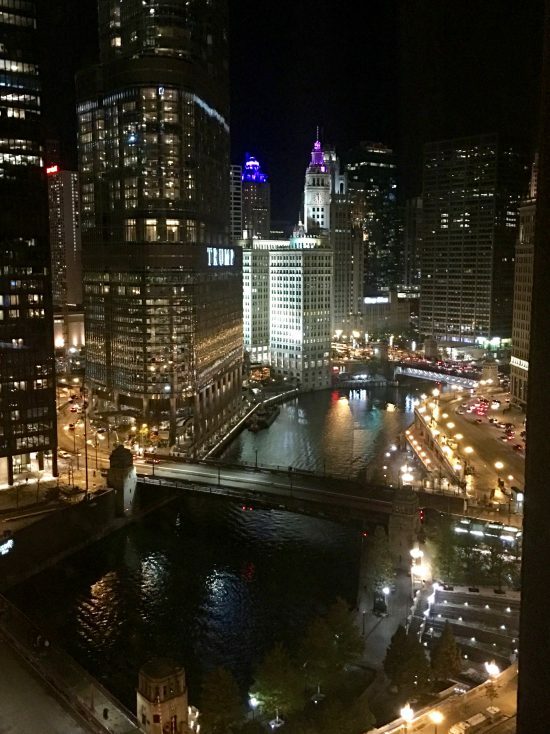 There are many good options it seems, but after some research I decided on the Renaissance Chicago Hotel and we can highly, highly recommend it. For starters, this was the view from our room. I was hoping for a good view but I couldn’t have imagined this. We had two large wingback chairs in our room that we pulled up to the windows and we spent a lot of time there just relaxing and watching the city. Part of the appeal was the action on the river, including tour boats and water taxis going past. 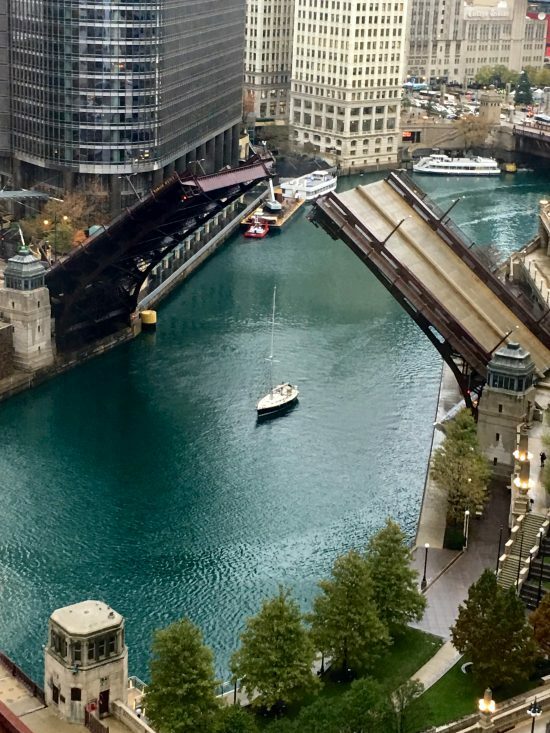 On our last day a sailboat came in from Lake Michigan and we watched as traffic was stopped and the bridges along the river were raised, one by one, to let the sailboat with its mast pass through. So interesting that one little sailboat created all that activity. Because we stayed on the south side of the river this trip, we did a lot of exploring in the Loop, which we hadn’t really done before. 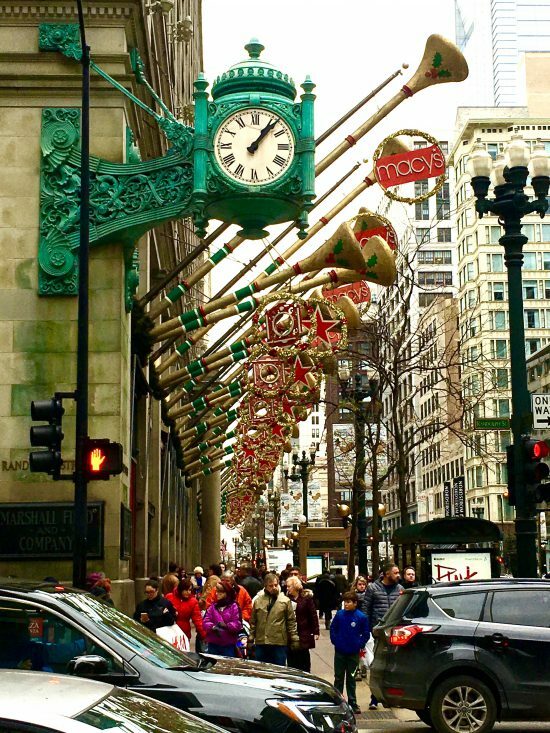 That included a stop at the Macy’s on State Street (formerly Marshall Field’s), which was all decked out for Christmas. We took in all the window displays and went inside to see the Great Tree in the historic Walnut Room. 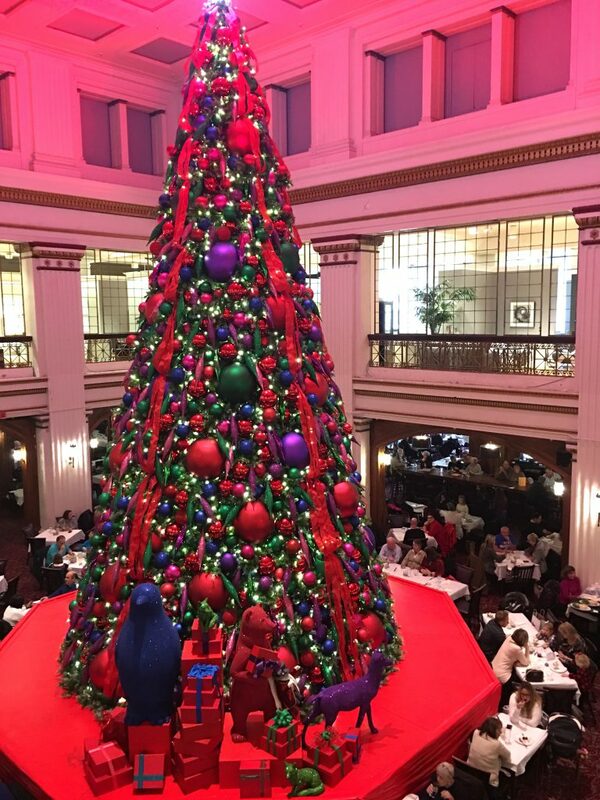 I had hoped to have lunch in The Walnut Room but the timing didn’t work out, so we just ogled the tree and watched other people eat instead. 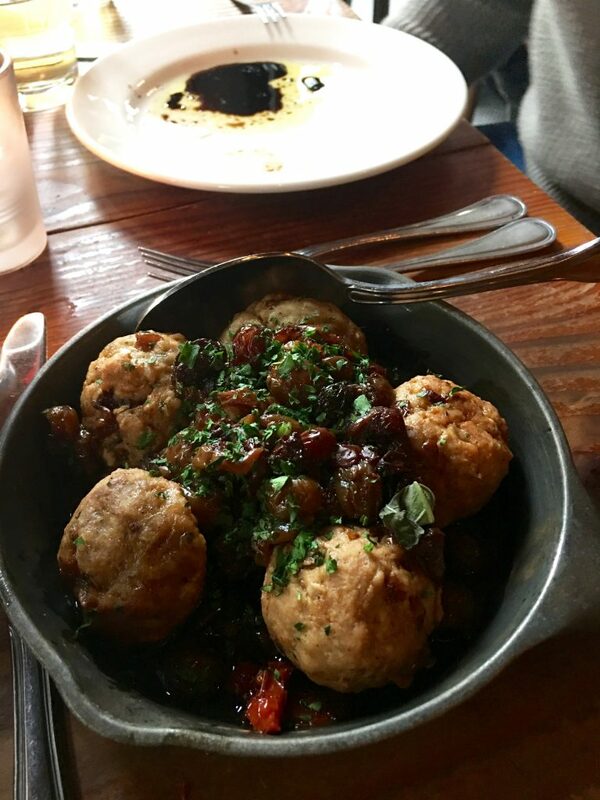 We didn’t go hungry though, as we revisited some favorite Chicago restaurants and discovered a couple of new favorites too. Chicago style pizza is always a must (we ate at Giordano’s this trip), and we had dinner with friends at Joe’s, which we’ve eaten at before and LOVE. We also ate had lunch not once, but twice, at Quartino, which has the BEST Italian food served small-plate style. 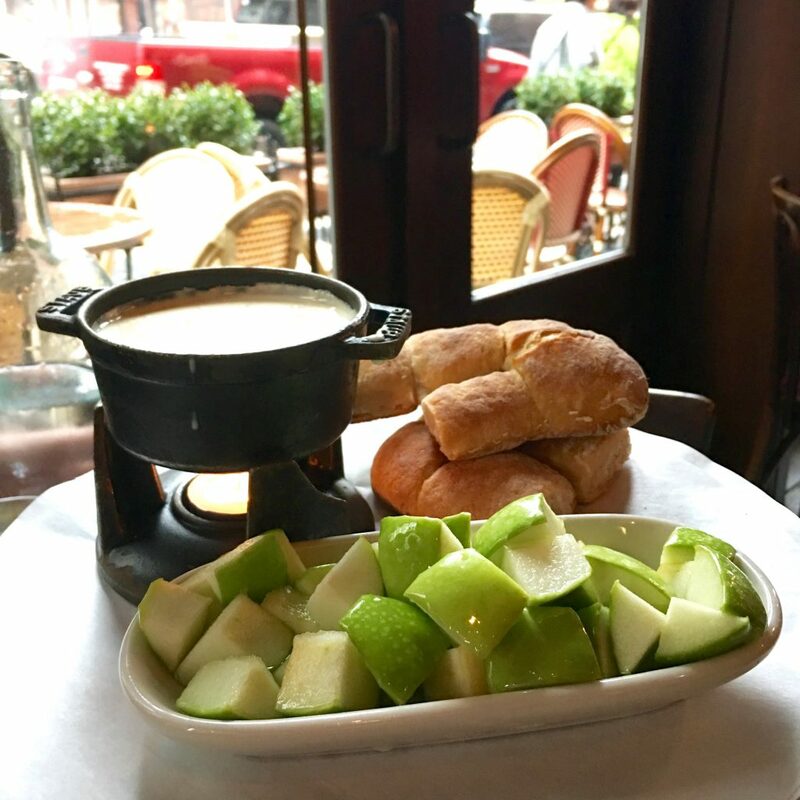 We had this fondue with bread and apples on both visits. 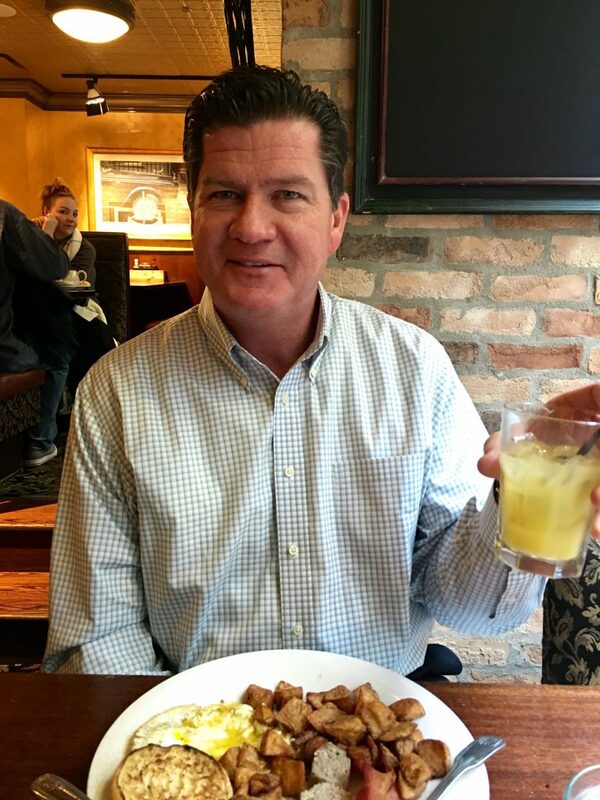 Another favorite restaurant was also Italian: Topo Gigio in Old Town. We ate there before a show at Second City as it’s just a few doors down. The bartender told us they get a lot of Second City go-ers, but there were also some regulars from the neighborhood having a weeknight dinner at the bar. Loved that! Both the food and the atmosphere were wonderful. 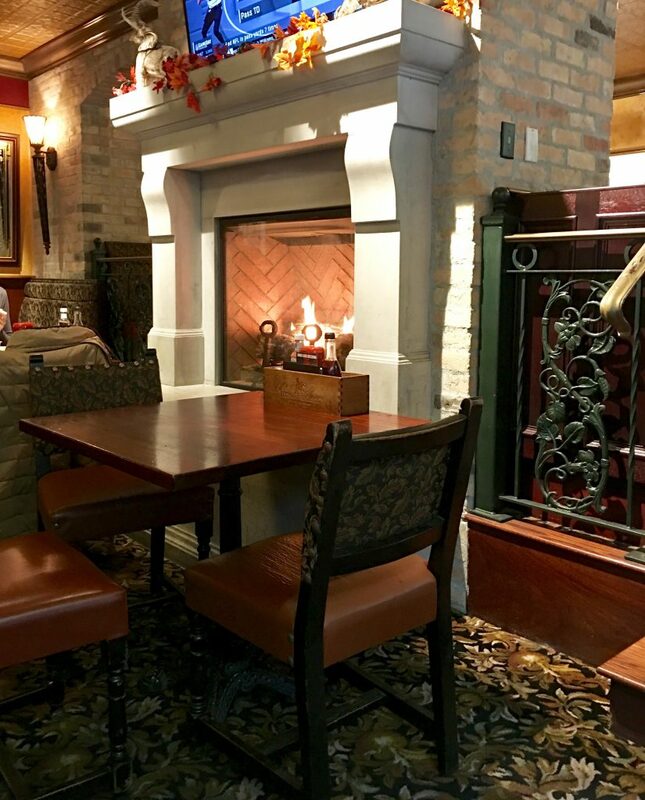 Think cozy and classic, with exposed brick walls and white tablecloths. We would eat there again in a heartbeat. And can you handle one more restaurant recommendation? 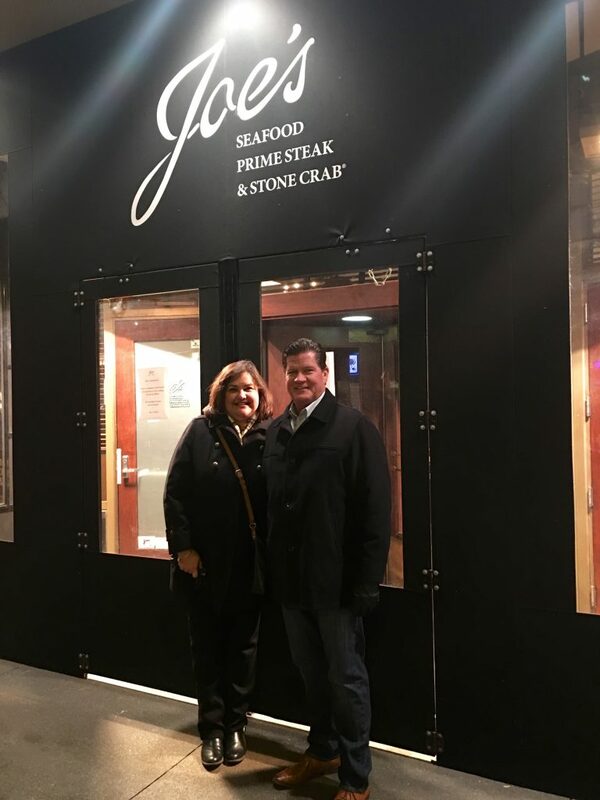 (If it seems that we ate our way through Chicago, we did!) We also ate twice at Elephant and Castle, an English-style pub near our hotel. Our first stop was for breakfast on Sunday, and we stopped back in the next day for a bowl of potato soup. This was another cozy restaurant (more brick, more dark wood, chalkboards!). Cozy restaurants are always my favorites, but especially so when it’s chilly and damp outside. At first we chose this table by the fireplace, but it was actually a little too warm, so we moved to a window seat nearby where we could both see the fire and also watch the people passing by on the sidewalk and the elevated trains going by outside. We did almost no shopping on this trip, but I couldn’t leave without stopping at P.O.S.H. I shared lots of pics and details of my first trip to P.O.S.H. 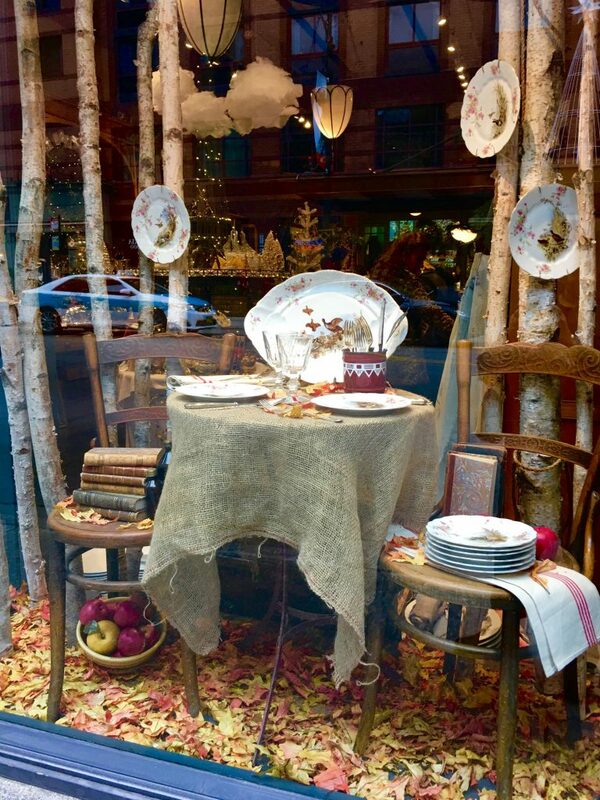 here, so this time I’ll just share pics of their wonderful window displays. P.O.S.H. is worth stopping at just for the displays and styling alone. And I’ll leave you with this picture of the two of us with Grant, who drove up from St. Louis for the basketball game that, along with Tom’s birthday, was actually the reason for the trip. Grant was in town for less than 24 hours, but you have to grab time with those college kids any way you can! Thanks for indulging me with this little trip report of one of my favorite cities. As you can see, we had a great time. Once again you’ve made me want to carve out some time for a quick trip into the city. We live 50 miles away in the northern burbs, but rarely make the trek downtown. Maybe it was the mouthwatering reminder of Quartino’s that did it, not sure, but I’m going to put this on the “short list” and hop on a train very soon! Also, thanks for featuring Elephant & Castle. We ate at one on our recent trip to The Poconos and loved it! Didn’t even realize we have one in our backyard. I get it, Karen! Why is it we rarely explore what’s in our own backyard? I hope you make that trip soon. You have such a fabulous city. I’ve heard Christmastime is especially beautiful. We often come for this same basketball tournament and it’s just a bit too early for that. This made me so happy. I have lived in Chicago my whole life and it really is a great city. It seems like all the news reports is all the crime that goes on. I always think that people that don’t live here must think the whole city is like that. You really did hit a lot a great restaurants! Loved all your photos too. 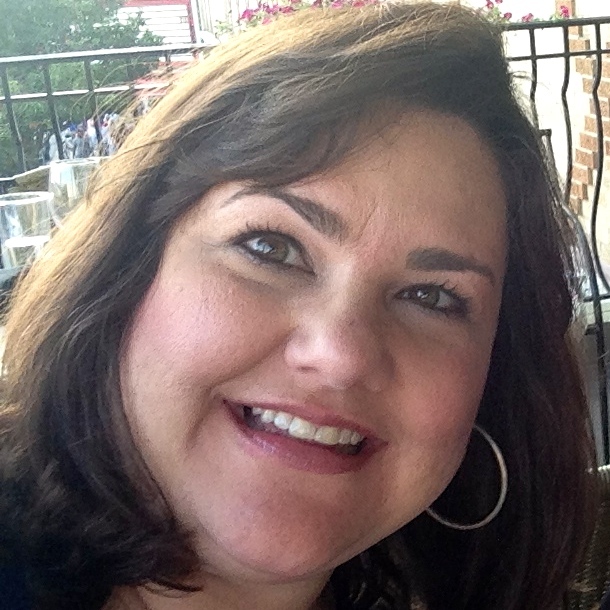 I’m popping in from Stacey’s blog and the tour of your home, which is just lovely. It is so comfy looking and you definitely nailed it by making every room looks so lived in and welcoming. My brother and sister in law, and family live in KC. I’m going to get out that way sooner or later! I loved this post as I’m from Chicago and have lived here all of my life. So many places you visited, I know very well. When I worked downtown, where you stayed, we call that the business/theatre district. I worked there for a few years and my desk on the 8th floor of a high rise faced the corner where Macy’s, formerly Marshall Field is located. Great memories and a huge distraction! lol! Most of all, I can feel your awe and love for our city. Thank you for that! Going to follow your blog–you sound like such a genuinely lovely and sweet blogger! Thanks for dropping by and for your comment, Pat! Happy to know another kindred soul. Hey, Julie! I’m linking over from Poofing the Pillows. 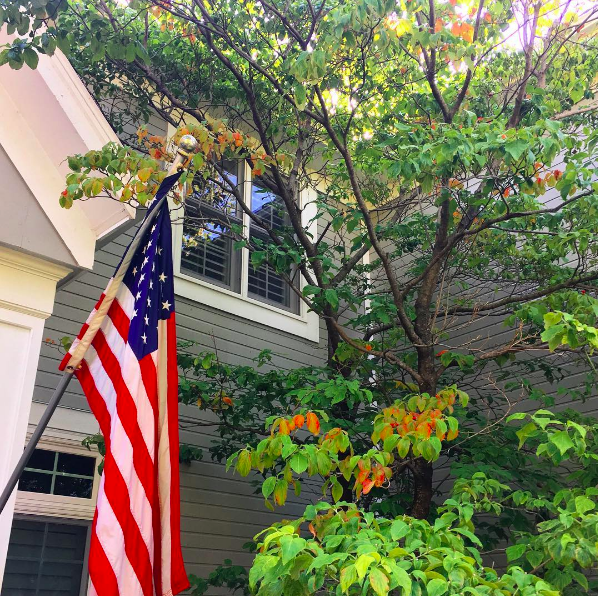 I enjoyed your home tour! We love Chicago. We’re Cubbies fans, and we try to go every year to see a game. We love Giordano’s Pizza, and we LOVE LOVE LOVE Chicago Pizza and Oven Grinders, too.